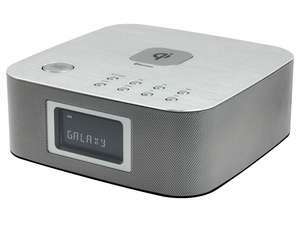 The superb soundmaster DAB950 Bluetooth Speaker with FM / DAB Radio & CD Player is the latest in complete home audio products from soundmaster which can also double as an effective and powerful TV soundbar alternative. Available in two very complimentary designs and colours (black carbon knit finish or walnut brown wood-grain effect) these discreet but powerful units, featuring two 15W speakers, are suitable for a wide variety rooms around the home. Combined with everything you will want for audio in your home - the soundmaster® DAB950 DAB Radio HiFi System with Bluetooth is the ideal all-in-one system. With simple connection to Bluetooth you can pair and stream audio from mobile and tablet devices quick and easy with just a touch of a button. FM and DAB radio is also included, with telescopic antenna attached, you can tune in to local, regional and national radio with ease. From a design point, the carbon black unit features a high shine chrome front and blackened speakers, whilst the walnut brown unit features a brushed stainless steel frontage with silver speakers - both however do have a clearly lit LCD screen for all track and system information. Control your soundmaster DAB950 in a number of ways - with the built in touch panel on top of the unit alongside a rotating volume control, or the function-filled remote control to give you complete control from a distance. The remote control gives you the ability to change pre-set EQ settings as well as bespoke user equaliser settings for bass and treble for that personal touch. Rear USB inputs can also be found - one for playback and another for mobile charging (5V-1A). 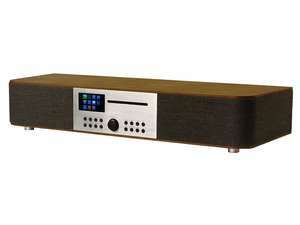 As a complete audio HiFi system that also has a fantastic alternative set-up for TV audio connection - the soundmaster DAB950 is truly a complete home audio product.